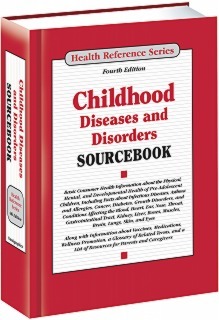 Childhood Diseases and Disorders Sourcebook, 4th Ed. Some children suffer from chronic diseases that limit their daily activities or threaten future health, and even healthy children often face illnesses and injuries. In addition, 20% of school-age children are currently considered obese, and others are affected by environmental hazards, lack of physical activity, poor diet, and other dangers. Childhood Diseases and Disorders Sourcebook, 4th Edition, provides up-to-date information about common disorders that affect the physical, mental, and developmental health of school-age children. It discusses infectious diseases, asthma and allergies, cancer, diabetes, growth and developmental disorders, mental health and conduct disorders, and conditions affecting the blood, brain, muscles and bones, skin, and internal organs. Guidelines for promoting wellness and preventing injuries are also included. This book is organized in the broad subject areas detailed below. Parts focus on broad areas of interest. Chapters are devoted to single topics within a part. Part I: Introduction to Children’s Health and Safety provides basic information on routine and emergency medical care for children, as well as guidelines for childhood wellness. Part II: Childhood Infections and Related Concerns focuses on foodborne, bacterial, viral, and parasitic and fungal infections that can occur in childhood, as well as other diseases associated with infections. Part III: Medical Conditions Appearing in Childhood discusses a wide range of conditions and disorders that are generally diagnosed during childhood. It includes facts about allergies, cancer, diabetes, growth disorders, and disorders affecting the blood and heart, ear, nose, and throat, gastrointestinal tract, endocrine system, kidneys, liver, muscles and bones, brain, lungs, skin, and eyes. Part IV: Developmental and Pediatric Mental Health Concerns details mental health disorders than can affect children as well as common developmental and learning disabilities. Part V: Additional Help and Information provides a glossary of terms related to childhood diseases and disorders and concludes with a list of resources for parents and caregivers.